I love mexican food. Yesterday, I was asked by the editor of a Food mag to dig up an article I wrote years back for a Travel guide. Its about Chilli or Chile, whichever you prefer and quite enlightening. Read on..
For Mexicans, Chile is its own food group. Many a Mexican will have fond memories of aromatic chile roasting in the autumn air. Mexicans celebrate their beloved child with festivals, countless child cook-offs and even an annual convention. At any given times, a Mexican somewhere is probably eating chile, whether it be salsa and chips, green chile finely diced in a sandwich or burger, or a burrito smothered in red chile. You get the picture; Mexicans eat chile on just about everything, anytime, anyday. Legend has is that it was in 1598 that the Spanish Mexican Settler-Onate's expedition brought the first chile seeds from Old Mexico to the United States and rest of the western world.. Anthropologists and Native Americans, however, say that the plant was there much earlier. Wherever it arrived, the chile pepper was and is certainly there to stay and not in America alone. Along with corn and beans, chile is the foundation of Mexico's home cooking and a newer haute cuisine that is waking up taste buds the world over. As much a part of the Mexican heritage as its architecture and arts, Mexican distinctive cooking is different from what you'll find in the U.S., Spain or India or even elsewhere in the American Europe. Despite a limited number of ingredients, early cooks created an ingenious repertoire of dishes, many of them-but not all-highly spiced. Enchiladas, buritos, carne adovada, and huevos rancheros are among the popular dishes in Mexican traditional restaurants, where chefs often work from old family recipes, that use traditional local ingredients in inventive new ways. Regional organic farms grow a wide range of food and spices. For added variety, exotic ingredients are flown in from around the world, as gourmet restaurants with international fare cater to sophisticated travelers. 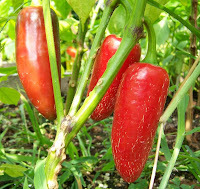 First of all, the chile pepper is a fruit-even though it's sometimes referred to as a vegetable. Second, it can be an ingredient, a sauce or a hearty stew. Third, and most important, chile peppers range from the mild bell pepper to the hot-as-Hades habaneros. Many chefs like to use a pinch or so of the latter in their sauces to add some heat to the flavor. Not long ago a Mexican legislator tried to have "Red or green?" declared the official question. It is asked where ever where chile is served. If you're not sure which you prefer, ask for your chile "Christmas style". You'll get both. Red and green chile come from the same plant. Chile is green when picked early, red when allowed to ripen on the vine. To the question of which is hotter, the answer is: It depends. Heat varies with the kind of chile used, with growing conditions and with the cook's method, so ask your waiter about the chile being served. If eat concerns you, ask for your chile on the side. Psst : if your chile is too hot, don't reach for water. The best way to quench the fire is to take a bite of something sweet, like a honey-laden sopaipilla-or have a glass of milk. Dairy products can ease the intense chile experience, which is one reason fro the sour cream topping on many dishes. Not sure about you're chile every night? No problem. There are more than 100 mexican restaurants in India, ranging from corner restaurants to Fivestar establishments featured in international magazines-something for every pocketbook and every taste. You'll find urbane dining as sophisticated as that of worldclass restaurants in New York or Paris - or easy going cafes just like in India. Breakfast: 1) Breakfast burrito-scrambled eggs, potatoes, cheese, and a choice of ham, bacon or spicy chorizo (pork sausage) wrapped in a flour tortilla and either smothered or filled with either red or green child. 2) Huevos rancheros-corn tortillas covered with fried eggs, pinto beans, chile and cheese. Lunch: 1) Green child cheeseburger-a true Mexican staple. Every place says theirs is the best, you decide. 2) green chile stew-vegetables, meat and green chile, another favorite. Dinner: 1) Carne adovada-cubes of pork marinated in red chile and baked until tender. The best almost melts in your mouth. 2) Enchilada platter-corn tortillas either rolled up or stacked flat like pancakes with any combination of beans, meats, red or green chile, or both (Christmas), onions, lettuce, tomatoes, sourcream, or guacamole. There are many variations and enchiladas can usually be made to suit each person's tastes. Insider's tip: order a fried egg placed over a flat enchilada. A true Mexican favorite is the sopaipilla. These pillow-shaped, flour pastries are deep-fried in oil until they fill with air. They are served at most Mexican restaurants and are simply delicious with honey. Many restaurants also serve sopaipillas stuffed with beans and meat, and smothered with chile as entrees. For a truly cross Mexican experience, sample Native American cuisine. Try fresh-from-the-horno fry bread at a roadside stand. Indian tacos are fresh lettuce, tomatoes, refried beans, guacamole, sourcream and chile piled, open-faced, onto puffy tortillas or fry bread. paper-thin sheets of piki bread are excellent dipped in stew. They are made from finely ground corn cooked in boiling water until it turns to mush and then spread over a hot flat surface. What's hot? Your Glossary Guide To Mexican Food. Atole - Thick, hot corn gruel. Burrito - Flour tortilla roller around beans, beef or chicken, cheese &/or potatoes, smothered in chile, sprinkled with lettuce, tomato & onion. Carne Adovada-Pork marinated and cooked in red chile, garlic & oregano; often served in a burrito. A true Mexican specialty. Carne Asada-Roasted or barbecued beef or pork, cut in strips. Carnitas-Strips of beef or pork marinated in green chile & spices. Chalupas - Corn tortillas fried & layered with beef or chicken, beans, shredded lettuce; topped with guacamole & salsa. Chile con Queso-Melted cheese & green chile served as a dip. Chile Relleni-Green chile roasted, stuffed with cheese, dipped in egg batter and deep-fried. Chimichanga-A deep-fried burrito, smothered with chile & cheese. Enchiladas-Corn tortillas layered with (or wrapped around) onions, cheese, chicken or beef; covered with chile. Fajita - Strips of grilled streak or chicken, sauteed peppers & onions, served with a salsa (see pico de gallo); rolled inside a flour tortillas (a make-it-yourself burrito). Flautas - Tightly rolled, deep-fried enchiladas. Huevos Rancheros-Eggs, usually fried, served on a corn tortilla and smothered with red or green chile & cheese. Jalapenos-Very hot chiles, used in salsa or as a topping. Menudo-A soup of tripe & chiles. Nachos-Topstadas topped with beans, melted cheese & jalapenos; may be served with ground beef or shredded chicken, guacamole & sour cream. Pico De Gallo-Salsa with tomatoes, onions, chopped fresh chiles & cilantro. Posole-A hominy stew which is simmered with red chile & pork. Quesadilla-A fried flour-tortilla turnover filled with cheese or other ingredients such as beef, pork or chicken. Refritos-Refried beans. Salsa-A mixture of fresh chiles, tomatoes & onions. Sopaipilla-A puffed, fired yeast bread that's eaten with honey. Taco-Corn tortilla fried crisp and filled with meats, chopped lettuce, onions & tomatoes. Tortilla-Round flat bread, available in corn, blue corn or flour. Tostadas-Corn tortilla fried into chips. Yes to a hearty Appetite! hey very informative being in food i never researched on the history of food.